There’s nothing like the first week of Standard results and a big event on camera to make me look both quite good and quite bad. We’ve had more than a few cards jump, and jump impressively, from Guilds of Ravnica and from the other Standard-legal sets. Today I want to look at a few of those cards and see if there’s still room for growth, or if it’s time to get out. This is a popular sideboard option in a range of decks, including the still-popular Mono-Red and the more midrange Boros Angels. It’s been printed a bunch of times, though, and this is not going to hold. If you can buylist older copies, I’d do that. It’s not huge in Commander, either, so we don’t have that going for us. It is fantastic against slow control decks. Mostly they can’t rip apart your hand, and the uncounterability is very very relevant in a metagame which has Teferi. That’s from a few weeks ago when she was $13. I go on to say not to buy her, as going from $15 to $20 is hard to cash out of. Lyra is so good in so many ways, maindeck and sideboard. Her value against mono-red is extreme, as you can’t race her for long (she kills you!) and she’s pretty amazing at boosting your team of Angels. She’s in a weird spot. I think she’s going to hit $30 again, but that rise is not enough to get me to buy at $23. If I had any, I’d hold a bit longer. As I said in the preorder article, I tried like hell to make Browbeat good. The problem was that they would always take the damage, and I’d have to hope to draw another piece of burn. Jump-start makes this card so much better. It’s not five damage once, but eight damage on the second casting. I should have figured this one out, frankly. My comparison was accurate–Browbeat has never been a star–but I overlooked the power of getting two castings of the same spell from one card. I’m not buying at $9, not for a rare in a set with shocklands and is likely to sell ridiculously well, but in three months when this is a $2ish card and we’re moving to the next set, I’ll remember this. I’m looking high and low and I can only find a couple of decks running this as a sideboard sweeper. Easy to forget it’s a mythic. Yes, it’s a cute combo with Truefire Captain, but that seems like a questionable combo, the four-mana creature and the seven-drop sorcery. It’s a mythic from the big set, and it’s spiked hard with a year to go till rotation. It’s seven mana. It’s not seeing any Modern play. It’s not popular in Commander. It’s seven mana. Dump this card right now. Now this makes a lot more sense. It’s a two-or-three of in all sorts of red decks. It’s quite popular with the decks that would run The Flame of Keld, but instead of a one-time boost of two extra cards, it’ll just play as many as possible in a row. It’s very straightforward and quite powerful. I don’t see it going a lot higher, but it’s going to get some camera time soon and that’s REALLY going to get people flocking to the card. I fully expect a streamer to give it some serious play and that might bump it a little higher…but not enough to make it worthwhile to buy at $5. 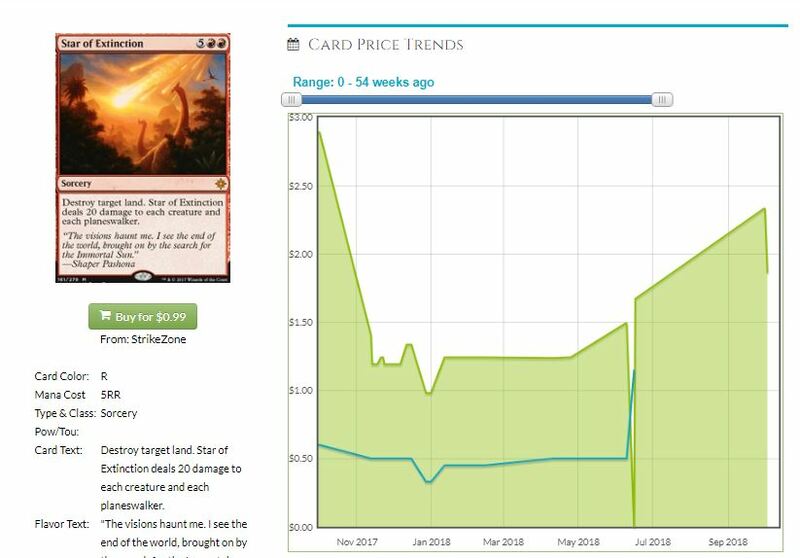 The proliferation of low-to-the-ground red decks is encouraging me to pick up a couple sets of Vance’s Blasting Cannons at bulk prices. The Buy-a-Box promo is tempting at $6, too. Unique versions of cards always get me thinking, even if they aren’t immediately good. It turns out that the enemy-colored enchantments from Rivals of Ixalan fit VERY well with the the guilds that share a color. Plus there’s this deck, which is a testament to the question, ‘What does a Meren deck look like in Standard?’ and the answer is, the grindiest of grindy decks. 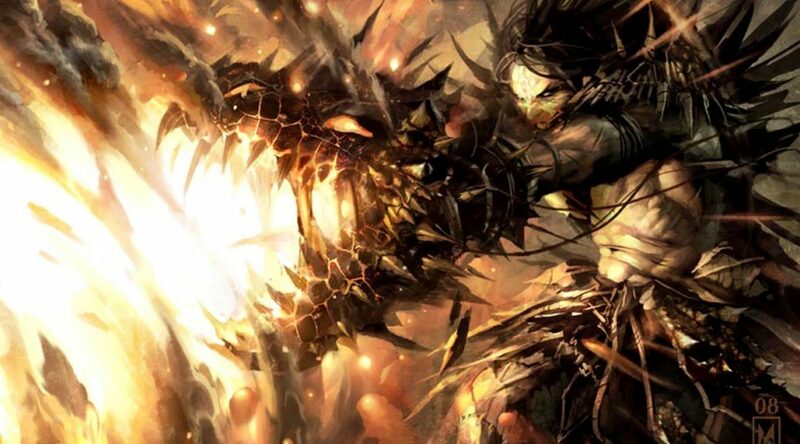 Is that deck good against the many flavors of aggro AND the controlling decks? We’ll see. The jump for this card got me thinking about the other Rivals transform cards. Path of Mettle is a lot of hoops to jump through, but the land’s ability to deal two damage is good. Field of Ruin is still a thing though, and people are packing the hate to deal with Azcanta, the Sunken Ruin. Buying in at around a dollar each is a pretty low point of entry, but it’s a big jump from mono-red aggro to Boros aggro. Storm the Vaults doesn’t play with Izzet’s plan at all. A shame. Godless Shrine will be besties! Profane Procession is in the next block, as is Hadana’s Climb, making those two very strong targets. 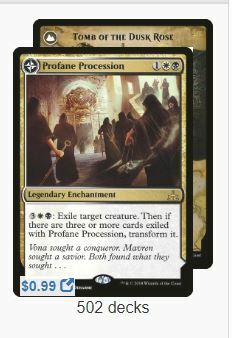 Procession will cost you $1-$2 each, and you’re placing a bet on how viable Esper control will be once we get the Orzhov cards. 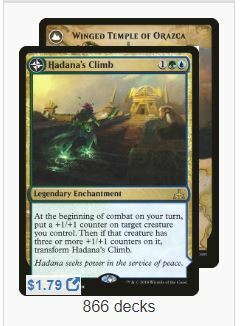 Hadana’s Climb seems like an even better target because of the ‘play it and flip it’ factor we’ve seen glimpses of. Ironshell Beetle seems like an odd reprint right now, but what if it’s hinting at what the Simic will be up to? The previous sets had a lot of counter synergies, and I’d be surprised if that wasn’t true this time around too. Just good in so many Simic ways! The Climb is at about $1.50 each right now, but it’s only present in 866 decks over on EDHREC. For a card with that little play, that price is a little high, and I suspect the invisible hand of the casual players is at work. I like this as a buy right now, and if it doesn’t hit in three months with the new Simic cards, you’ve got a long-term spec to pack away until it gets big again.